Once more the articulated LCD of the Sony DSC H50 comes into its own. 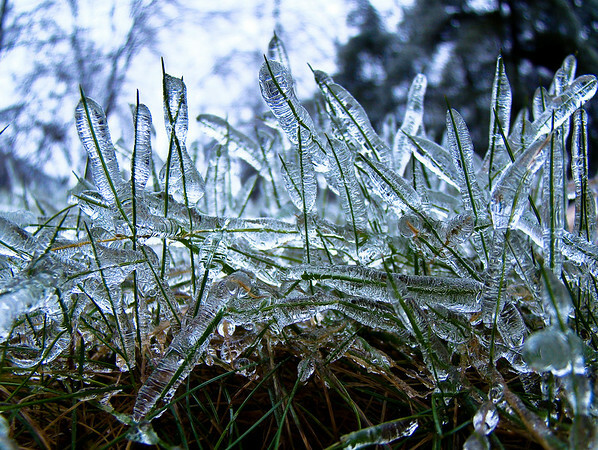 Right down at ground level, centimeters away from the grass blades encased in ice. And the 2 cm macro helps. I was able to catch the sky light in the ice around the individual blades. Dim light, still raining a bit. 32mm equiv. F2.7 @ 1/60th @ ISO 100. Programed Auto. Cropped (some sky at the top, out of focus grass and ice on either side). In Lightroom, added Clarity and Vibrance (not much effect). Sharpen Landscape preset. Increased the highlight value slightly to bring out the light in the ice. Still raining. I was working fast to avoid getting my camera too wet. The light was miserable. 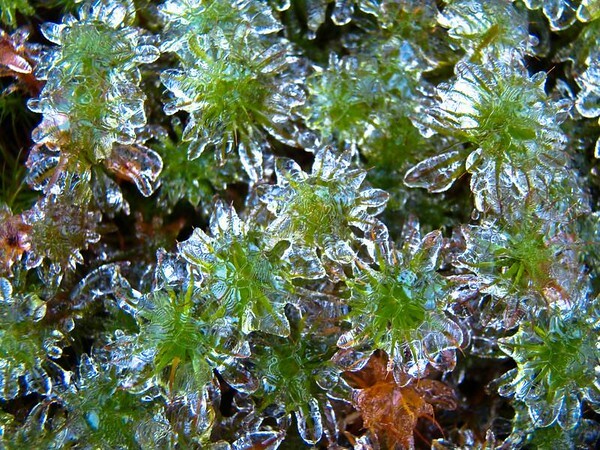 This is moss. Very tiny. Taken from 2 cm close focus of the macro at the 32mm equiv. F2.8 @ 1/40th @ ISO 400. Programed Auto. In Lightroom this shot required some lightening, a bit of color temperature correction to warm it, my usual Clarity and Vibrance, and Landscape Sharpen preset. Because of the higher ISO it also required some noise reduction, both Luminance and Color. It is still not critically sharp. The slow shutter speed and the awkward position (even using the LCD), combined with my hurry lest a big drop of half frozen slush fall on the camera and forever short it out, all combined to soften the image. Still, it is a very pleasing shot at screen resolution, and would look fine printed at wall hanging size, from the usual several feet of viewing distance. 1 to 1 on the screen, or in a print from an inch away, you would see the softness. This one caused a lot of discussion over on Digital_Photography_Forum. Thanks all. It was orginally posted like this, as it looks on Facebook. 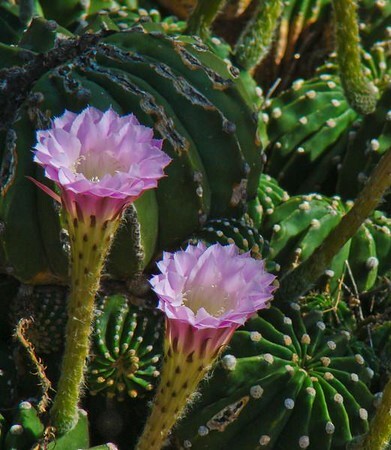 Commenters felt it was unbalanced because of the flower on the right. I went back and cropped it tighter, eliminating the flower on the right all together. Then I applied a bit of Fill Light in Lightroom to bring up the background and brightend the image overall to bring up the blossums. F5.6 @ 1/800 @ ISO 100. Programed Auto. Taken at the full telephoto position of the Sony DSC H9’s zoom, equiv. to 465mm. 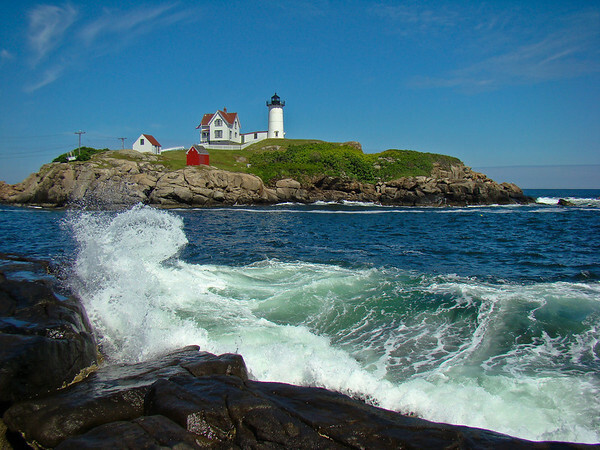 Nubble Light is one of the most popular tourist attractions in southern Maine. On a sunny day in the summer, you often have to circle the small parking lot for 30 minutes or more to catch a space open, and you have to work really hard to get a shot of the light, on its own little island off-shore, without people in the foreground. That is why I worked my way down to the very edge of the channel that separated Cape Neddick from the Nubble. It was an all but perfect day. A few big white puffy clouds behind the light would have been nice, but I was happy with the really amazing waves chasing each other up the channel and crashing against the rocks with huge gouts of spray. I took 100s of shots, trying to capture a wave at it’s most photogenic, against the lighthouse and its rock as backdrop. Persistence almost always pays off. It did here. Sony DSC H9. F5.6 @ 1/800 @ ISO 100. Programed Auto. Full wide angle (31mm equiv.) on the zoom. In Lightroom, I applied some Recovery to bring out detail in the white mass of the wave, and to darken the sky. Added Clarity and Vibrance (which made the blue sky deeper and the red building really pop), and used the Sharpen Landscape preset. With a subject like this, and such a day, it is then just a matter of timing (and a willingness to scramble around on exposed rock that trembles with every smashing wave). 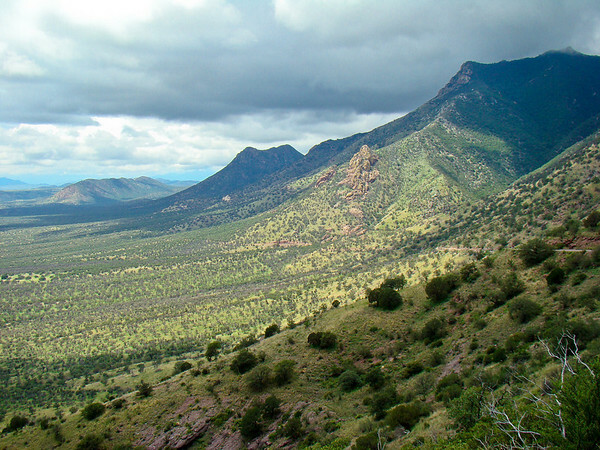 Coronado National Monument, south of Sierra Vista AZ, right on the Mexican border, is one of those little, lightly visited gems of the National Park Service. We visited twice in our 7 days in Sierra Vista, and on both trips had the visitor’s center to ourselves. We saw no other hikers either day on extensive hikes on the wonderful trails. This is a view from the actual monument, a short steep climb up from a parking lot at the top of the long, well graded road that runs up and over a high pass. Ours was the only car in the parking lot. We are looking north west here, along the west side of the Huachucas, on the other side of the pass. Mexico is right behind us. It was a stormy day in the valleys around Sierra Vista, and there was a good deal of moisture…some haze…in the air, and that effected the shot. This kind of haze, however, is a natural part of the scene during the August monsoon in Arizona, and, to me, does not detract from the view. Taken at the wide end of the zoom (31mm equiv.) of the Sony H9. F5.6 @ 1/640th @ ISO 80. Programed Auto. In Lightroom, I did try to deal somewhat with the haze. Recovery was used, along with Clarity and Vibrance, and I reduced the luminosity of the blue color band (the most scattered by haze). Sharpen Landscape preset. Some have criticized this shot as having no center of attention. What caught my eye, and still catches it, is the play of light and shadow over the foothills and mountains: the great dark mass of rock overhanging the slopes. From the Cochise County Gallery. 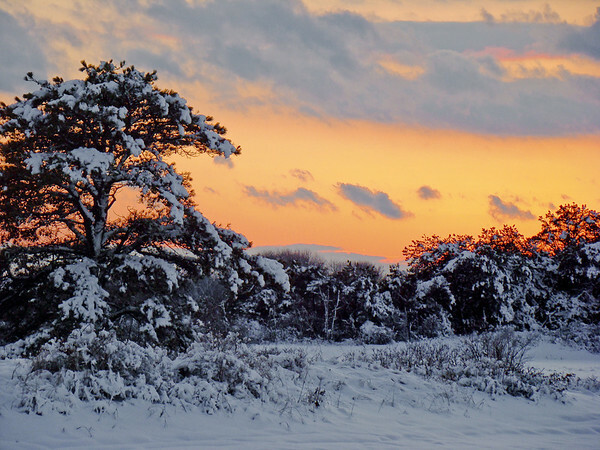 White snow, orange sunset. Shot at moderate telephoto, 125 mm equiv., to set the tree and bushes against the sky. Pretty straight-forward. Programed Auto. F5.0 @ 1/500 @ ISO 100. Exposed for the sky, so it required post-processing to bring up the foreground. Mainly a lot of Fill Light in Lightroom. My standard added Clarity and Vibrance. Landscape Sharpen preset. Some noise reduction to compensate for the Fill Light. 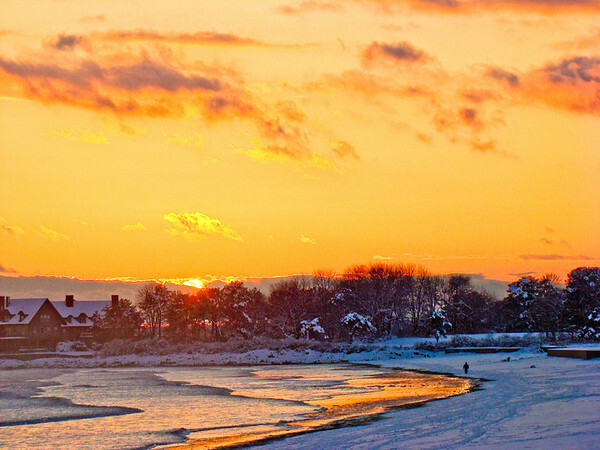 I had to desaturate the blue channel in Saturation/Luminance/Hue controls to control excessive blue in the snow.